Looking for some help in getting outdoors more? In this post we feature three popular Hiking Clubs in Calgary. These hiking clubs run trips throughout the Rockies, and many of them also do other great activities such as hosting social events and programs to learn more about outdoor skills. Many of us think hiking is only for the summer. But hiking clubs are starting to do more winter trips, either with micro-spikes, snowshoes or skis. 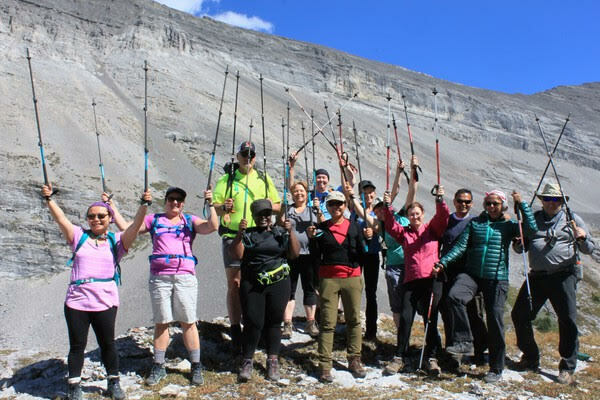 If you’re interested in finding a hiking club in Calgary, we’ve outlined a great selection here that offer a huge variety of exciting opportunities – from a tight-knit club formed decades ago to newly formed ones that already boast thousands of members. And it doesn’t matter if you’re a beginner or expert, in your mid-20s or mid-80s, there’s no excuse not to set out and explore all the magnificence Calgary has to offer. Hiking in numbers is much safer. If something goes wrong there’s more people there to help. Groups can be a lot of fun! There’s quite a few groups who plan social nights outside of adventures, or some groups will plan on having a hike followed by a potluck dinner. You’ll be surrounded by like-minded people who love the outdoors just as much as you! Hiking Clubs keep you motivated, safe, and are a fun way to get to know new people. 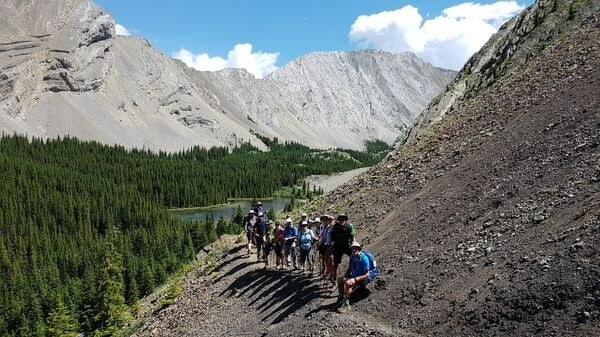 Calgary’s Popular Hiking Clubs typically plan events all year long. This list is ordered loosely by location, but not by quality. We don’t have a favourite. We love them all! Slow and Steady is part of the increasingly popular website “Meetup.com”. Founder Andy Dragt dreamt up this concept after growing frustrated with the way many of his fellow hikers tackled the routes. “Everything seemed to be a competition and a speed event,” he said. “I was losing the love of hiking and needed a change.” Hence, Slow and Steady was born. Meetup.com makes getting involved easy because there is no membership fee. The group is one of the largest ones out of Calgary, and they plan lots of events. And one of the best parts? Even with so many members, you will find familiar faces on most hikes you do. Due to the size, you’ll find the activities take place all over the Rockies: Kananaskis, Banff, Yoho, Kootenay, Jasper, Assiniboine, Mount Robson, Waterton, etc. If you’re looking to check out these or other winter events Andy says, “Microspikes are a must for hiking.” He added that you should buy, “proper gear especially boots and non-cotton clothing”. “I believe that the more the merrier,” says Andy, when discussing the large number of coordinators. “With a good number of organizers we’ll have more for our members to enjoy”. That definitely seems to check out, because Slow and Steady has a large number of scheduled activities! So what to do if you want to be an organizer? Firstly, you have to have some proficiency in the activity. Besides that, they like an organizer to have a history with the club and to also be approved by at least two members of our leadership committee. So why should you pick Slow and Steady? CORE is a smaller, Calgary-based hiking club. They’ve been around since 1999, and are composed of a very tight-knit group of outdoors lovers. We had the chance to talk with one of CORE’s founders, Carol Miyagawa. Carol is understandably proud of CORE, as it’s incredible to see a club run successfully for almost 20 years! CORE’s founding is actually quite an interesting story… Aimee, the founder, was working in an information office along a popular pathway and new hikers would drop-in, wanting to join hiking clubs. At this point, the waiting lists for these hiking clubs were very long, and Aimee knew it would be awhile before these new hikers got into a club. So Aimee started taking down names and instead guiding these new-hikers out on hikes herself. These groups grew and grew (Carol was part of these early gatherings) and eventually they decided to make it official. The $20 membership was created back in 1999 and it hasn’t changed since. According to Carol, “It’s pretty much all over, maybe with a bit of an emphasis on Kananaskis country, probably because of the variety of things you can do there. But, we also go to Lake Louise…venturing into Yoho sometimes too.”. They also organize urban walks around Calgary too. 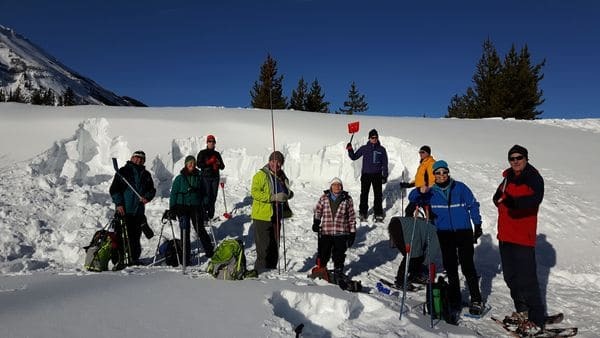 CORE is very open to new members joining, and in winter especially for those interested in snowshoeing. “In January, we’re having a fellow from Norseman Ski Shop to talk about snowshoeing techniques and safety,” mentions Carol. “With our snowshoeing trips our coordinators will post easy ones at the start of the season,” she added. But, if snowshoeing is too much for you, “go and buy some microspikes from MEC”. She added that, “if there’s not enough snow to snowshoe it would still allow us to do a hike as long as they had a traction device.” Then of course you’ll need waterproof boots and lots of good layers to keep warm! There is an easy process to become a Trip Coordinator with CORE, usually involving working with existing co-ordinators first. 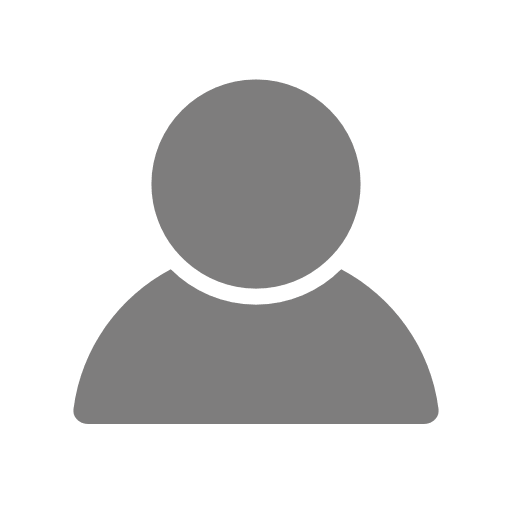 The club has Coordinator resources online as well that you’d have to read. “And,” Carol added, “they also have to learn how to post things on our calendar”. So why should you pick CORE? 5th Dimension, a 130-member club with a set Thursday schedule that runs year-round, is one of the many seniors-only (above 55) outdoors clubs in Alberta. We were fortunate to speak with Martin Ferguson, Vice-President, and Riet Wynker, a past President. The two of them are also neighbors. “I was a member before Martin was,” said Riet, “I became a member in early 2003 and I’ve enjoyed it ever since. I got Martin enthusiastic about it and his wife too.” Riet’s husband, Brian, is also a long-standing member who, at 81, is still one of the most active members of the group. 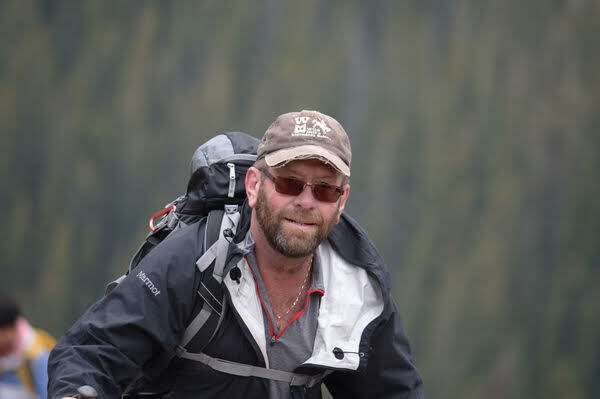 “We go mostly to Kananaskis, Banff, and Lake Louise,” said Riet. “If the trails in the spring aren’t good we’ll go to Drumheller, Lethbridge, Cochrane or Red Deer. In the winter we go to where the snow is.” Like a few other Seniors’ clubs, they have a bus shuttle that takes all the members to the trailheads, a great amenity that we’re surprised other hiking groups don’t offer as well. Before you can become a member, you have to come to a few events first. You can register to be a “call-up member.” A call-up member will be called if there are open spots on the bus (there is typically a couple open spots each Thursday). If they come to a few events and enjoy it and as Martin says “show their abilities and willingness to be in the club” then they’ll get invited to be a member. Members will pay their fee and then be notified the details of each weekly event. They offer different difficulty levels each week: A, B, and C. “A” goes the longest, the farthest, fastest, and highest. The B’s go a little less than that and the C’s less than them. Also, there will typically be two different B groups and sometimes two levels of C groups too. So, in that way, a beginner can come to a few events and try the lower levels first if they’re unsure of their skill. According to Martin, “We’re always looking for volunteers”. They have twelve executive members and most of the positions are nominated by the Past President, the position held by Riet currently. The other positions are typically given to those who volunteer for them. So why should you pick 5th Dimensions?